This chapter, the introduction, surveys historiography concerning the development of Japanese medical insurance programs. 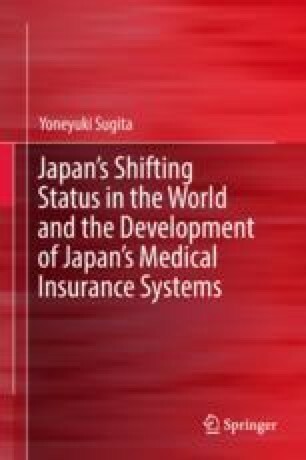 Then, it explains three new perspectives in terms of the development of medical insurance programs in Japan—placing emphasis on the external environment, especially Japan’s changing status in international society; making detailed, scientific, and empirical studies based on the analysis of primary documents about the roles of the government; and relativizing the importance of World War II. OECD. (2017). Life expectancy at birth (indicator). https://data.oecd.org/healthstat/life-expectancy-at-birth.htm. Accessed May 4, 2018. OECD Family Database. (2017). Chart CO1.1 A. Infant mortality, neonatal mortality, and post-neonatal infant mortality rates, 2014 or latest available year. https://www.oecd.org/els/family/CO_1_1_Infant_mortality.pdf. Accessed May 4, 2018.